My immediate response was to say to myself that I wouldn’t do this exercise because I read the book some time ago and have written about Edgelands in the past plus I already have a pile of new books around that subject waiting to be read. However, the book does contain some thoughts on bridges and canals (which I’ll read later) For the time being I’ll read the two chapters from Edgelands that we’re pointed towards and regard them as a revision/spur for future reading. Farley, P & Symmons Roberts, M (2011) Vintage Books. NB: The images are my own. (Old fencing remaining in public woodland despite continual upkeep. One worker said the old fencing probably belonged to a private landowner as the land there is mixed between private and public and there are areas where they can’t work. I’ll see if I can find out more as this fits with my prospective Assignment 6). Farley & Roberts trace wire all around and about – stretching it over and underground, single, sagging, double-weave. 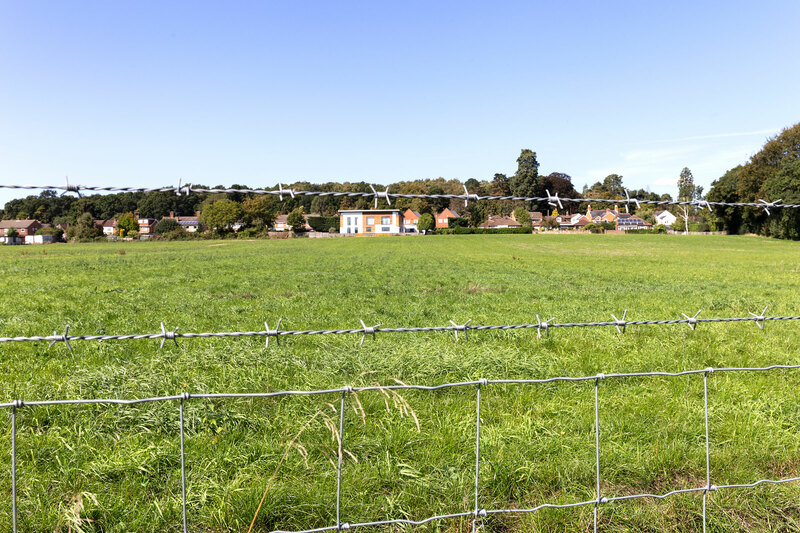 “The edgelands are a complex mix of fiercely guarded private ground and common land by default or by neglect. And the history of these places is held in their wires” (2011:93). Children can climb chain link so it needs to contain more barriers – spikes, barbed wire etc. Then there’s the terror aspect of razor wire. Deterrence. They write about the fence in Greenham Common – the battleground between the US Air Force and the women protesters. What memories might be stored in these now taken -own wires – can they hold recordings of past sounds? Fences are used to hold tributes; tended like graves. (they’re also used for protests). Bolton Council wanted to put a time limit on such ‘shrines’ and suggested a permanent tree memorial to honour victims of road accidents – but the memorial is not the point for those grieving relatives, “The Place is the point. They want the act of remembrance to be rooted in the place where their son, sister, mother, friend last drew breath, took a final fateful step off the kerb”. Cooling towers can act like signposts to edgelands, “[….] They designate the in-betweenness of the landscape you are passing through. Beginning on this path leads the authors the language of metaphors and how these , “unconsciously change our understanding of ourselves and the world around us”. (p.185). If so, could a personal development group be held standing in the shadow of the ‘cooling towers’. You are ‘cooling’, feeling the force, feeling empowered, become the ‘power station’. Farley & Roberts acknowledge the contradiction of colling towers/power stations – how they are dirty, ugly eyesores, yet up close their structure can be truly appreciated. They also generate myths (Really!?). They refer to the power station at Didcot which has been called ‘Cathedral of the Vale’ and was designed by Frederick Gibbard the architect who designed Liverpool’s Roman Catholic Cathedral. (p.188). Artist and poets have been interested in them. “Cooling towers are no longer simply a symbol of technological change […] For many they are chilling symbols of ecological meltdown”.The authors ask if power stations are a marker of edgelands; a defining characteristic. We can’t live without them but we don’t want to live with them, and we push them far away if we perceive danger from them, e.g. wind farms. They (jokingly?) suggest we bring power generation back to where it belongs in the form of wind farms, “How majestic it would be, on our way into or out of cities, to drive past strips of giant white daffodils blowing in the breeze” (p. 193). I certainly have always been fascinated by Battersea Power Station and electricity pylons!. Taken in the same location in different years 2012 and 2018, right beside the Muslim Peace Garden, Woking. I think the pylon was replaced with a smaller one and moved further back to allow more breathing space for when the lonely, abandoned Muslim Burial Ground was transformed into a new Muslim Peace Garden. This entry was posted in Part 2 on January 23, 2019 by Catherine. Interesting distinction between “Land Art” and “Earth Art”. The former having a conceptual basis through representation of the experience of visiting, travelling to or through the land. The latter being direct intervention within/or use of the raw materials of a landscape and the work being generally made or presented in situ. I have done both on several occasions, the most lengthy being in July 2017 with an attempt to create an ‘installation’ in the local copse by weaving wool on around a dilapidated bench. The project was abruptly brought to an end in September 2017 when the small area I worked in was ‘dismantled’ and re-created into a scene somewhat like a version of Stig of the Dump. Since then I have paid attention to the ways in which other people leave their ‘mark’ on/in a place in various ways and will include my observations in subsequent posts where appropriate. 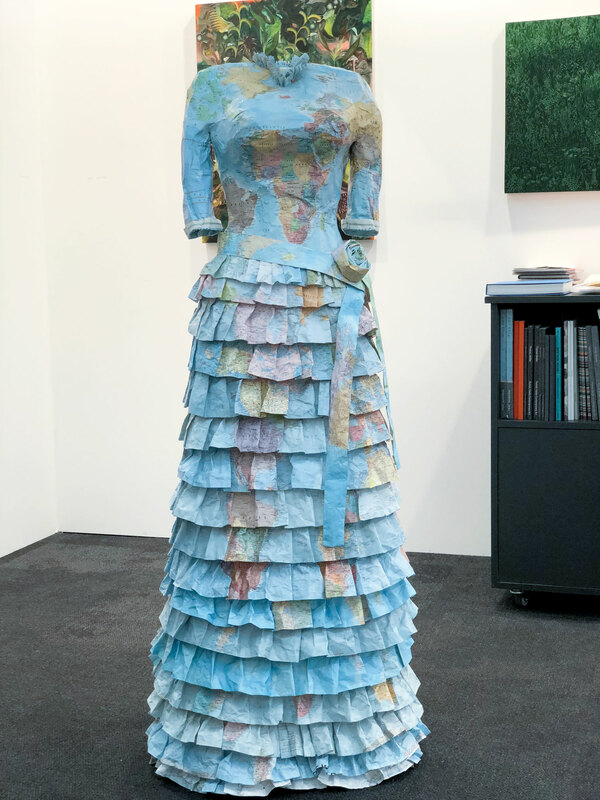 I read the article suggested which is Sean O’Hagan’s preview of the exhibition Heaven and Earth (2009). Long’s creations are often “as transient and impermanent as anything in the natural world around it”, for instance his 1967 In A Line Made by Walking exists now only in a photograph. In the interview with O’Hagan, whilst acknowledging that he likes the notion of the visibility or invisibility of the work Long says that this was not his main interest which actually was to realise a particular idea. Also he might take very long walks yet the ‘work’ he creates may still only take up half an hour of his time. What came into my mind when reading about this was the notion of apparently simple art stemming from a more lengthy contemplative process. During my exploration of his work I found a 2012 video which interested me particularly because it was made at Box Hill Nr Dorking, Surrey. The video was made at night-time and on the eve of the Olympic Cycling Road Races. In August last year I did a brief paper-making workshop right on the top of Box Hill, with Jane Ponsford. This was just one small part of a collaborative project Surrey Unearthedwhich involved ten artists who explored and celebrated the materials that form the landscape of the Surrey Hills. I found out about this too late to see the outcome but this project has stayed with me as the type of project I would like to undertake at some point. At present I’m building up a resource list of artists and projects as inspiration and these in part or whole will be my working guides for Assignments. In a similar manner to Richard Long’s ‘textworks’ write down 12-24 brief observations during a short walk or journey by some means of transport. This may be the journey you intend to make for Assignment Two, or it may be a different one. You don’t need to take any photographs. In fact I chose to write down a few observations from some short videos and images I created with my phone camera on a trip to London last October to visit Tate Modern. I travelled by bus, train and on foot. Edgelands are on the edges of towns but what do you call those semi-wild areas that form a barrier between the road and houses? 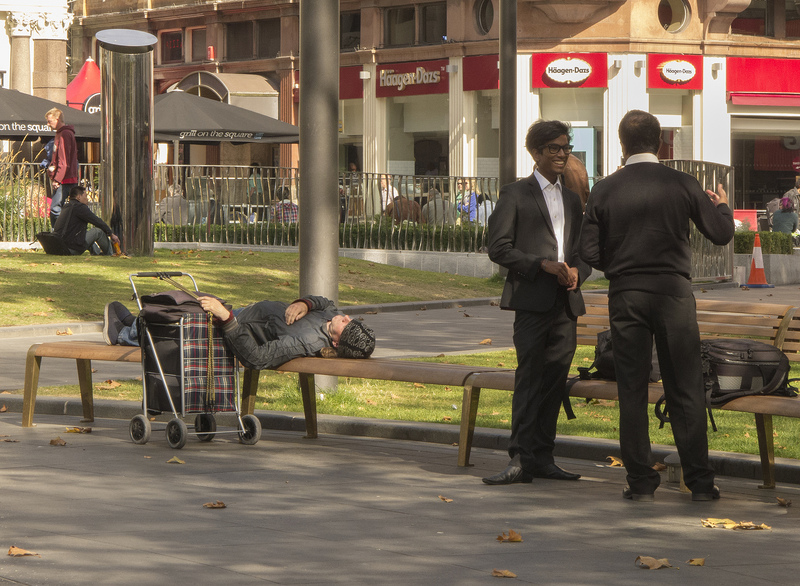 I really don’t know much at all about the lives of buskers. It’s always a relief to arrive home. The exercise brief provides us with three further artists to look at in considering how the observations might be presented. Barbara Kruger: synthesizes a critique about society by using a short declarative statement. Merges slick facades with unexpected phrases to catch attention. Aims to sell an idea that is meant to instigate a reconsideration of one’s immediate context. Appropriates images from original context and sets them as the background against which she emblazons confrontational phrases. They didn’t make me think so much as nod my head to agree. Maybe they’re more self-evident from being more didactic/ because I’m more used to seeing them or because there’s no choice but to either agree or disagree. Titchner does not appear to offer judgement or critique of the theories he appropriates. Rather, he provides a secular reinterpretation, maintaining a freedom to mix and overlay ideas. He exploits the catchphrases and clichés that bubble to the surface while dispensing with the theoretical frameworks from which they emerged. Through this process, he simultaneously highlights the redundancy of once radical thought whilst acknowledging the potential for certain aspects to seep quietly into popular consciousness. By amalgamating ideologies, Titchner persuades us to accept the validity of opposing beliefs, underlining both the susceptibility and complexity of the collective psyche. I then moved on to a TateShots video on YouTube. A visit to meet him in his studio. Such a creative tangle; likely a reflection of all the art sources, theories, information, reading that he has absorbed, although I have to confess that seeing it made me feel a little better at my own crammed space. I wanted to understand more about his approach and found a video on YouTube from the Art Gallery of Ontario (2013) about the time he spent as their Artist in Residence in the Fall of 2012. It’s quite long at 10.35 minutes but put here as my reference. The work comes from the point of view of lack of belief or lack of meaning. Depict a slight emptiness. They’re a suggestion but left there dangling and require the viewer to activate them. Looks like advertising but doesn’t fit one thing or another. The single biggest element is the text which drives everything. Trying to use language which everyone can understand even though it’s complex. Even using four words I have to keep the ambiguity. Every word has to be refined. Working in a collaboration with a group – a map is important. Mapping the City from the point of view of emotional interest. How to start with nothing and to make a design to realise that. Re urban change – sourcing background material – how historical areas have changed. The City as being a non-static, evolving place. Messing around with a City slogan, producing a mantra. Ideas of how a City brands itself and how that can reflect on you as a resident. His motto is “The World isn’t working”. To be honest, I hadn’t previously paid much attention to Titchner’s work because it seemed more slogans than images but now having looked closer I think it’s brilliant. At the moment I’m thinking less of use of text as an overlay but more generally of how I use it. Do I want to retain ambiguity even with a few words or do I want to drive home a message more directly? On the whole I prefer to think that generally I offer a comment/narrative which is more observational than didactic, but I’ve become aware that that could be more difficult for me when I’m writing about my own immediate environment and what is happening to it. I’m most taken at the moment with those last points about how a City brands itself; how that reflects on me as a resident and, much more widely “The World isn’t working”. This entry was posted in Part 2 on January 21, 2019 by Catherine. Read an article by Sean O’Hagan on the Exhibition curated by William Jenkins in 1975, which Jenkins termed New Topographics ; watch Tateshots video of Lewis Baltz (1945-2014) talking about his work. Detailed, precise description of a place or region. Graphic representation of the surface features of a place or region on a map, indicating their relative positions and elevations. The study or description of an anatomical region or part. Topographic maps are based on topographical surveys and are a type of map characterized by large-scale detail and quantitative representation of relief usually using contour lines. A topographical survey is typically published as a map series, made up of two or more map sheets that combine to form the whole map. As they evolved they became a natural resource in modern nations in planning infrastructure and resource exploitation. Idea first developed by August Pitt-Rivers. Towards the end of his career in the army (during which he became interested in the development of firearms) he inherited a large estate containing many archaeological sites and this provided him with the opportunity to indulge his interest in different types of tools across time. He sorted his collection into series which he believed demonstrated the tool’s logical progression and his international collection became the founding collection of the Pitts River Museum at the University of Oxford. The Show was curated by William Jenkins who brought together eight young American photographers – Robert Adams, Lewis Baltz, Joe Deal, Frank Grohlke, Nicholas Nixon, Jon Schott, Stephen Shore and Henry Wessel, Jr. Jenkins also invited the German couple Bernd and Hilla Becher who, since the late 1950s, had been photographing various obsolete structures in Europe and America. The Bechers first exhibited their photographs in series as ‘typologies’ often shown in grids, under the title of “Anonymous Sculptures”. All these photographers were students of photography, professors, or both. Stephen Shore was the only photographer who worked in colour. Nicholas Nixon – inner-city development, dwarfing skyscrapers, freeways, gridded streets. Stephen Shore’s use of colour heightened the sense of detachment. The inclusion of American work by Bernd and Hilla Becher – Pennsylvania salt mines and giant coal breakers – suggests ‘there was something determinedly European about this new American gaze. O’Hagan’s view was that the work shows still looks contemporary and still seems troubling in its ‘dull reflection of the uniform and banal’. The movements influence has been pervasive, cf – Andreas Gursky; Paul Graham, Candida Hofer and Donovan Wylie. The Exhibition marks the moment when the apparently banal became accepted as a legitimate photographic subject and a particular strand of theoretically driven photography began to permeate the wider contemporary art world carrying a political message and reflecting the growing unease about how the natural landscape was being eroded by industrial development and the spread of cities. I looked at the work of Lewis Baltz and Stephen Shore and also read additional critiques of William Jenkins’ contention that the work of the New Topographics movement is pure, neutral and non-judgmental. Baltz sees photography as the only deductive art – what is the camera looking at and why is he looking at that. His interest is in the commonplace and ordinary such as the houses that he and everyone else lived in. No one used to talk about this but it’s now a commonplace and trite subject matter. A lot of the world couldn’t be portrayed at that time plus there was a horror of facing the environment we had made for ourselves. Such were the fruits of mid-period American capitalism – “Well, look at them”. There is not one task for art; many tasks. He admires beauty but as an aesthetic position will leave that for others. For him a work of art is something to think about rather than something to look at. You might ask why there are no people in his photographs, yet there is so much evidence of human effort. Baltz ends by saying that the place for people in his work is the viewer – without the viewer neither his nor anyone else’s work exists. I had a closer look at Stephen Shore because he was the only person included in the Exhibition who photographed in colour. The MOMA entry describes him as “Always moving forward, never locking into a single style, and seeing each image as a problem to solve”. “His shifts between color and black and white, his use of both analog and digital technologies, and his constant variation of scale and subject have produced a visually disparate body of work in which the prevailing rule seems to be the absence of rules”. That sounds attractive at first glance – seeking clarity in an image, respecting natural light, taking as few shots as possible, but what is he showing us through his diverse approach? As well as people and places he shows us the clutter and detritus we trail behind us – litter, plastic toys, empty cans. depopulated town centres and the effects of deindustrialization. Shore was a pioneer of the use of colour and vernacular photography. In the 19709s and 80s he travelled through the United States, using colour, straightforward perspectives and formal composition to visually catalogue the modern American landscape. Photographers such as Andreas Gursky and Thomas Struth have acknowledged his work as an inspiration. I was reminded of Exhibitions of theirs I have been to see. Very large images – larger than life sometimes – Gursky (I wrote about him here https://catherinebankslnd.wordpress.com/2018/06/09/andreas-gursky-at-the-hayward-gallery-16thapril-2018/, stringent use of composition and stylistic features – light and shadow. Creating patterns from multiple images, reducing scenes to layers and forms – giving a sense of everything being the same. I identified with those words in the Baltz 1992 interview and his reference to ‘bulimic capitalism’. It thrives now right here in the UK. Stephen Shore’s apparent rule of ‘the absence of rules’ sounds freeing, yet within the variety he shows us the effects of bureacratic decisions on our environments. Andreas Gursky now portraying a world where everything seems the same – no individuality. At the moment I’m too drawn to the depressing aspect of typologies – looking for similarities in difference as if we were all electricity pylons built in different countries yet for the same purpose. I would prefer to look further to look at the differences in similarities. Yes – all the tract houses, social housing, large new private housing developments show repetitive patterns, look similar, yet they are occupied by people – living human beings, with their individual personalities, quirks, eccentricities, talents, beliefs. That’s what’s missing for me at the moment in typological approaches – going beyond the external to look at what’s beneath, inside. I read more widely than I’ve indicated here – looking at various critiques of Jenkins’ view of New topographic. Perhaps this reading will be something I return to later in the Module. This entry was posted in Part 2 on January 13, 2019 by Catherine. Read an essay by Joel Snyder in Mitchell, W.J.T. (ed) (2002)Landscape and Power, Chicago. The University of Chicago Press. Summarise key points then find and evaluate two photographs by any of the photographers Snyder mentions. To probe the motivating factors behind two American western landscape practices of the 1860s and 1870s in order to come to some understanding of why these photographic landscapes look the way they do. Snyder gives a brief history of Photography’s early development up to the late 1850s and I have summarized these by creating a force field analysis – it’s quite basic but working at it helped to get timeline changes in my head. Snyder goes on to further explore two differing American landscape practices through case studies of Carleton Watkins and Timothy 0’Sullivan and the role each of them played as photographers with exploration surveys in the American west. Carleton Watkins acquired photography skills when he was taken on to work in a San Francisco Studio two years after travelling there in the hopes of finding gold. He travelled to Yosemite and produced some of the first photographs seen in the East. Subsequently Watkins worked on commission for the California State Geological Survey, mining and lumber interests and, by the 1860s, for the Pacific railroads. Within his images he harmonized the landscape with industrial progress – playing man-made designs against the natural environment in his compositions; reducing highlights and shadows to a smooth continuum or producing rich mid-tones. Watkins’s audience were encouraged to see the land as a site for potential development whilst being offered reassurance that it could withstand endless mass migration and industrial exploitation. There was no recognition of the land’s original inhabitants who lived in mean reservations away from it. Watkins combined technical excellence with conventions derived from picturesque and sublime modes of landscape depiction. He was emulated by nearly every important photographer of the American West up to and including Ansel Adams and thus set the standard for commercial landscape photographers of the American West. Neither Watkins nor his audience thought of his work in terms of art-historical analysis and there was no recognition that he might have created his images to produce particular impressions in viewers. His images were instrumental in the fight to preserve Yosemite as a national park and one of its many mountains is named Mount Watkins in his honour. A rolling landscape, harmonious tones, soft water reflections. Depicting a place where the visitor could sit and contemplate peaceful surroundings. Much less is known about Timothy O’Sullivan, although he is known to have worked for Matthew Brady, one of the earliest American photographers, as a teenager. He was subsequently commissioned in the Union Army then rejoined Brady’s team after his honourable discharge. 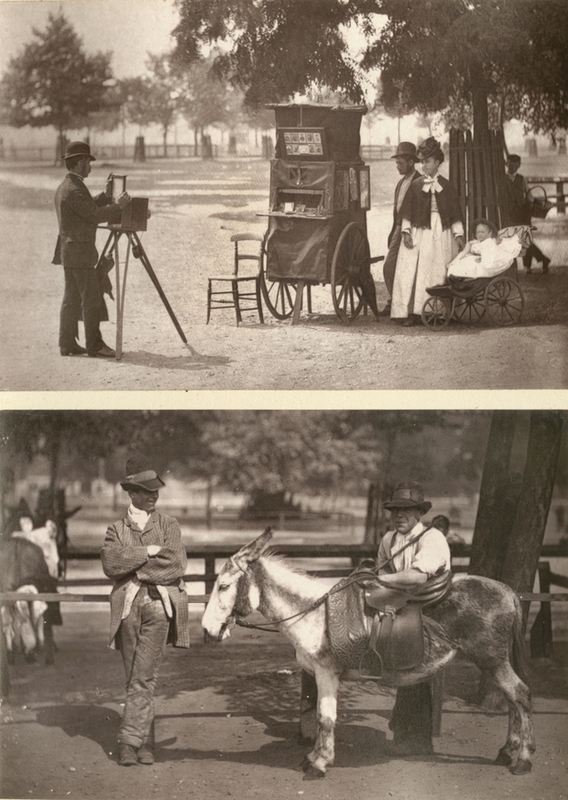 Following this he followed John Pope’s Northern Virginia Campaign and subsequently had photographs published in the first Civil War photographs collection after joining another studio – that of Alexander Gardner, who published the Collection. It has been written that O’Sullivan moved beyond traditional war images, which usually portrayed armies at rest to capture instead the grim and gruesome realities of armed warfare. From 1867 to 1869, O’Sullivan was the official photographer on the United States Geological Exploration of the Fortieth Parallel, under the direction of A.A. Humphreys by Clarence King, his job being to photograph the West to attract settlers. O’Sullivan later acted as photographer with the team searching for a canal route in Panama and was subsequently associated with a series of surveys in the southwestern United States, during which time he also photographed Native Americans. On his return East he was appointed first photographer for the newly established United States Geological Survey and, in 1880, on the recommendations of Brady, King and Gardner, was appointed chief photographer for the Department of the Treasury. He died of tuberculosis at the age of 42. Snyder describes O’Sullivan’s work as being ‘singular’ as opposed to that of other Western photographers as his images portray a bleak, inhospitable and god-forsaken land. 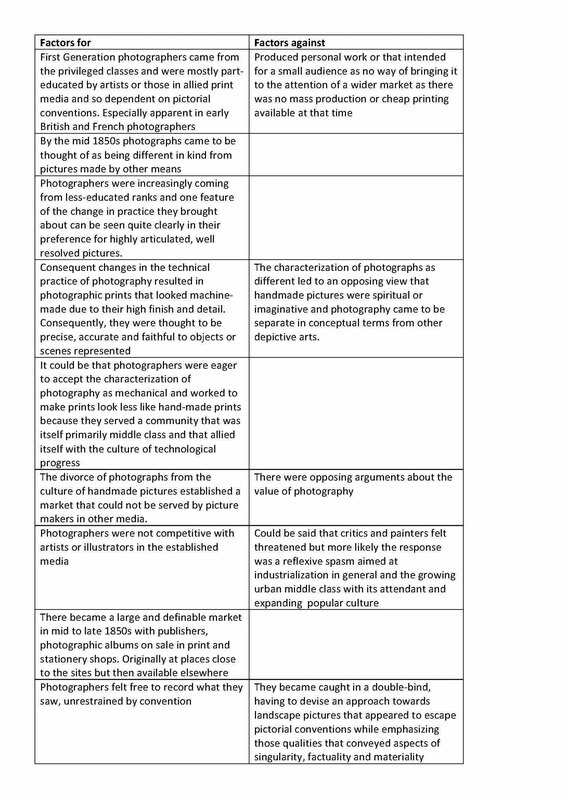 I have previously written here concerning Rosalind Krauss’s 1982 analysis of O’Sullivan’s photographs in relation to her criticism of the way in which photography historians in the 1980s were attempting to disassemble and then reassemble the photographic archive. She compares a print of a photograph (1868) and a lithographic copy of it produced for a book, Clarence King’s Systematic Geology (1878) asserting that the print belongs to science whereas the photograph operates with 19tcentury discourse – itself organized around an exhibition space – its wall. Her view was that O’Sullivan was a maker of scientific “views” and not of landscapes. Joel Snyder refers to Krauss’s view in his essay and states that it is correct if the claim is that O’Sullivan did not conceive of his work in the same way, but Krauss claims that the scientific nature of O’Sullivan’s photographs somehow precludes an investigation of their pictorial character. The problem for him is that Krauss’s view assumes what is to be proved in that it assumes O’Sullivan went to the West as a scientist and his enterprise was scientific in character. However, both of his chiefs argued that photography was incapable of producing pictures useful for scientific purposes so each of them needed topographical draftsmen as well. Snyder points out that, if we dismiss Krauss’s claim, we are left with no explanation of what O’Sullivan was doing in the West. For Snyder, the short answer is that O’Sullivan was making illustrations for the interim and final reports published by the surveys, and the long answer was that he was making illustrations for an audience of two – his two chiefs – his job being to provide generally descriptive photographs of the places he visited, which function to give a sense of the area but not to be used for the findings of the various authors of the reports. Snyder explains that very few of the photographs reached an audience of non-professionals and they dropped from sight until Ansel Adams discovered a handful in 1939 which he sent to Beaumont Newhall, then acting curator of the Department of Photography at the Museum of Modern Art, New York City. Adams described them as “technically deficient ……. But nonetheless, surrealistic and disturbing”. Beaumont Newhall viewed the photographs as prototypical modernist photographic landscapes and published them in some of his histories. Therefore, O’Sullivan’s photographs entered into the modernist history of photography where they have remained. Having used the photograph Sand Dunes near Carson City (1867) to analyse how O’Sullivan achieved the composition and the placements of human figures as being dwarfed by immense vistas that obliterate individuality. Snyder goes further. He suggests that each type of photograph – either refusing to bow to the conventions of contemporary landscape photography (O’Sullivan) or exemplifying the values found in the work of many other western photographers (Carleton Watkins, William Henry Jackson or others) served the interests of the expeditionary leaders. 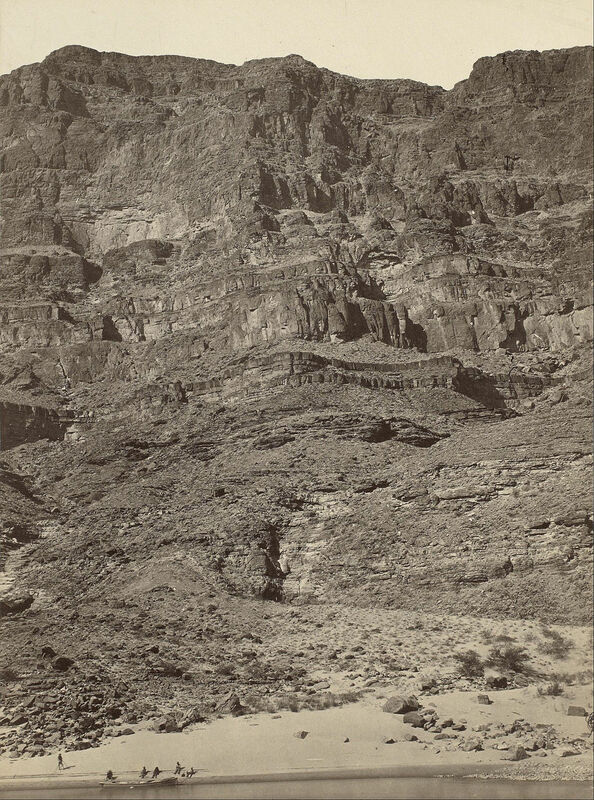 Whilst Watkins et al portrayed the landscape as a scene of potential habitation and exploitation, O’Sullivan’s photographs present the interior as ‘terra incognito’ and this fitted Clarence King’s belief that the inhospitable territory of Shoshone required a field of potential scientific enquiry that was properly the jurisdiction of scientific experts rather than the previous military explorers. Joel Snyder believes that O’Sullivan’s photographs mark the beginning of a continuing era in which expert skills provide the sole means of access to what was part of our common inheritance. 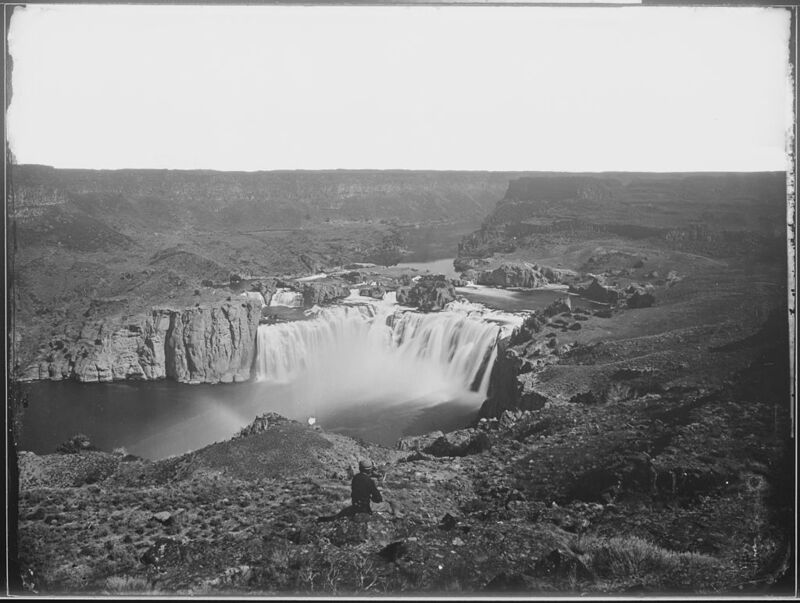 There’s a very interesting essay here by Frank Goodyear (2011) which looks at an early photograph of Shoshone Falls (which might include William Henry Jackson) and uses it to gain insights “into photography’s role in mediating the public’s understanding of the American West and in concealing/revealing the diverse populations and complex network of interconnected relationships that existed in southern Idaho during the 1870s. Shoshone Falls is apparently thirty-six feet higher than Niagara Falls and known for its sublime beauty. Bringing home photographs of it was vital to record the achievement of those who climbed and photographed it and their role in opening up the territory. Goodyear quotes a remark by one of the members of Clarence King’s party “there is in the entire region of the falls such wildness of beauty that a feeling pervades the mind almost unconsciously that you are, if not the first white man who has ever trod that trail, certainly one of the very few who have ventured so far (2011:272) and Goodyear goes on to describe the methods used to convey this sentiment – a single individual within the larger view (even though there were16 people in all in the party) with the single individual acting as a surrogate for the viewer of the image. e.g. And there is one in a similar vein here of the Grand Canyon with the small figures dwarfed by rocks. Timothy O’Sullivan had been a war photographer – perhaps seeing such gruesome sights caused him to suffer from post-traumatic disorder and contributed towards a depressive apprehension of the landscapes he photographed. At the same time, how could his views be described ‘scientific’ when he was conveying a ‘feeling’ towards the environment and using specific methods to do so? Perhaps Timothy O’Sullivan was one of those artists who were un-regarded at the time because his photographic vision was different from that of most of the others. Perhaps he really was a forerunner of the modernist style or of documentary photography.Maybe even photo-journalism considering his war photographs taken on the battlefield. The discussions around both photographers highlight the way in which historians and critics of photography apportion photographers to contemporary styles/genres which did not exist during that photographer’s life style. Reading about these photographers reminded me of all the different techniques which can be used to compose and convey the sense of a place that the photographer wishes to impart. I’m taking note of this continuing debate around photography and what should or shouldn’t be either considered art or to ‘fit’ in the gallery. This entry was posted in Part 2 on November 1, 2018 by Catherine.